1959 Scott Dillon Pig Malibu 9ft 1"
CONSTRUCTION: Foam blank, 1/2'' Stringer, with Volan glass and resin gel coat. 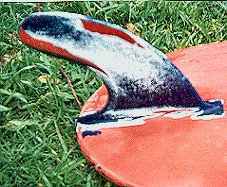 Dorsal fin, plain with orange gel coat, legrope hole. 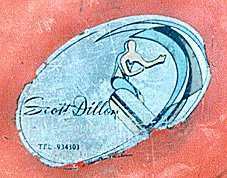 Adhesive Decal - 'Surfboard by Scott Dillon 41 Winbourne Rd Brookvale NSW' with surfer graphic/Oval at tail. Redesigned from the O'Neill (USA) logo - Scott Dillon. Board purchased at Nowra tip, 18 November 2000. 1. Extemely dirty - motor oil (?) on the bottom, blue paint on rails and fin. Photographs18 Nov.
2. Board cleaned. Photographs 18 Nov 2000. 3. Paint removed from rails at nose, tail, obvious repaired areas, fin tip and base. Body filler in some ding repairs. Original Volan repairs to nose and tail. Major knee well delamination repairs - 5 drilled holes, injected resin, possible orange pigment. Poor attempt to regloss/filler bottom and/or reaction with motor oil. 4. All paint removed from deck and bottom rails (not fin). Photographs 20 Nov 2000. 5. All paint removed, discoloured 'clear' resin coat removed from bottom and all dings repaired, August 2006. COMMENTS: Early example of Australian foam board circa 1960 - template, rails, gel coat and adhesive decal. The fin design is noteably futuristic. 1. 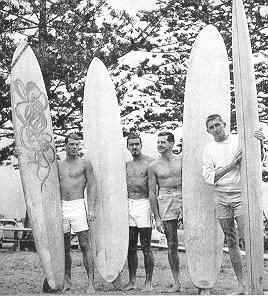 Pollard: The Australian Surfrider (1964) pages 28 - 29. Printed in Pollard The Australian Surfrider page 28, and others. Geoff Cater (1999-2012) : Scott Dillon Pig, 1959.